Enchanting is a crafting skill of combining runes to create glyphs, which are then used to enchant weapons, armor and jewelry. 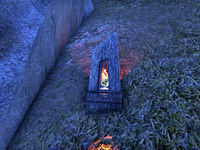 Enchanting is a crafting profession in Elder Scrolls Online. You can use it to combine Runestones into Glyphs, which add magical effects to weapons, armor and jewelry. The Enchanting skill line is granted the first time you activate an enchanting station. Experience gained in a craft is called "inspiration". Inspiration can be gained by Creating Glyphs, Deconstructing Glyphs, translating Runestones, completing Enchanter Writs or Master Writs, or reading Skill Books. The amount of inspiration gained from completing writs is based entirely on the potency level required by the writ and is detailed on the Enchanter Writs page. The amount of inspiration gained from Creating Glyphs, and Deconstructing Glyphs is based on your current enchanting skill level as well as the level and quality of the glyph. Deconstructing a glyph made by other characters (alts included) gives more inspiration than deconstructing a glyph made by you. Such glyphs can be readily found at Guild Kiosks, in treasure chests and Safeboxes, and other sources. Deconstructing a glyph made with the Ta rune gives less inspiration than a glyph made with Jejota. Deconstructing a glyph made with the Jejota rune gives the same Inspiration as a glyph made with Denata. Therefore, if purchasing glyphs for deconstruction, it may be more cost effective to focus only on Fine quality glyphs made with Jejota runes. Deconstructing a glyph made with the Repora or Itade cp160 runes, give more inspiration than deconstructing a glyph made with any cp150 Potency Rune. For example: deconstructing a Common (white) glyph, not made by you, with a Repora and a Ta, with the +20% Inspiration Boost passive champion unlock, will gain you 4569 inspiration at any level. Each level has a specific amount of Inspiration required before advancing to the next level as detailed in the table below. The amount required increases with every level, however the increase per level doesn't follow a set pattern. For example, consider the easy ascent from level 12 to 14, and the enormous leaps from level 38 to 40. The total inspiration required to go from level 1 to 50 is 3,667,895. You can learn about this profession by speaking with some of the enchanters, "Can you tell me about enchanting?" They reply, "Of course! Enchanting is the art of empowerment. We gather runes found throughout the world and use our special instruments to assemble them into glyphs. These glyphs can be used to magically enhance worn or wielded items." So, I'll have to find all these runes in the wild? : "Not exactly. Runes can be extracted from glyphs you find while adventuring. It's a delicate process, so you'll have to return to one of our work stations to proceed. Note that the glyph will be destroyed in the process. Unfortunate, but necessary." So how exactly do glyphs work? : "Glyphs are assembled by combining three different runes. Potency runes determine the glyph's strength. Aspect affects the glyph's quality. Finally, the Essence rune decides the glyph's effect. It's a delicate art best learned by doing. Good luck." In order to create an enchantment, you need three different types of runestone. These are Potency, Essence, and Aspect. Runestones can be harvested from nodes as you travel through the world, extracted from glyphs, or received in mail if you have the Hireling perks. Enchanters also sell Potency runes for gold. A single runestone provides multiple runes of different types. Essence and Aspect runes of all kinds can drop in all zones. Potency runes drop half of the time based on your level and the other half based on your rank in the Potency Improvement skill. While standing at an Enchanter's table, you combine one Potency, one Essence, and one Aspect runestone to make a Glyph. Unlike Provisioning, you do not need a recipe. If your character doesn't already know what the runestones do, you will learn their effects while creating the Glyph. The title and icon of the Glyph will tell you if it is for weapons, armor, or jewelry. Note that you must use a Potency runestone of the correct level for the item which you wish to enchant. For example, if you wish to enchant a level 10 weapon with a Glyph of Frost, you must use a Potency rune which covers level 10. There are three possibilities, Jora (level 1-10), Porade (level 5-15), and Jera (level 10-20). Obviously the highest strength Glyph will be created from the highest level Potency rune. While you must be at an Enchanter's table in order to create a Glyph, you do not need any special equipment in order to enchant an item with the Glyph in your possession. You simply select the item you wish to enchant in the Inventory screen, and choose "Enchant". The Glyph you have must be of the correct type and an appropriate level for the item to be enchanted. Note that any quality of Glyph may be applied to any quality of item. You could put a Legendary quality Glyph on a Base quality item if you wanted to. Special note about Armor Glyphs: Only Head, Chest, Legs, and Shields receive the full effect of an enchantment. Shoulder, Hands, Belt, and Feet receive only 40% of the stated value on the Glyph. Weapon traits are available on all weapons - axes, swords, maces, daggers, greatswords, battle axes, mauls, bows, restoration staves and destruction staves. There is one trait related to enchantments. Armor traits are available on all articles of light, medium or heavy armor and shields. There is one trait related to enchantments. Potency Improvement 1 ​ Allows the use of Jora, Porade, Jode and Notade Potency Runestones to make Glyphs of levels 1-15. 5 Allows the use of Jera, Jejora, Ode and Tade Potency Runestones to make Glyphs of levels 10-25. 10 Allows the use of Odra, Pojora, Jayde and Edode Potency Runestones to make Glyphs of levels 20-35. 15 Allows the use of Edora, Jaera, Pojode, and Rekude Potency Runestones to make Glyphs of levels 30-45. 20 Allows the use of Pora, Denara, Hade and Idode Potency Runestones to make Glyphs from level 40 to Champion 30. 25 Allows the use of Rera and Pode Potency Runestones to make Glyphs of Champion 30-50. 30 Allows the use of Derado and Kedeko Potency Runestones to make Glyphs of Champion 50-70. 35 Allows the use of Rekura and Rede Potency Runestones to make Glyphs of Champion 70-90. 40 Allows the use of Kura and Kude Potency Runestones to make Glyphs of Champion 100-140. 50 Allows the use of Rejera, Repora, Jehade, and Itade Potency Runestones to make Glyphs of Champion 150 and 160. Aspect Improvement 1 ​ Allows the use of Common (white) and Standard (green) Aspect Runestones. 6 Allows the use of Superior (blue) Aspect Runestones. 16 Allows the use of Artifact (purple) Aspect Runestones. 31 Allows the use of Legendary (gold) Aspect Runestones. Keen Eye: Rune Stones 2 Runes in the world will be easier to see when you are 20 meters or closer. 7 Runes in the world will be easier to see when you are 30 meters or closer. 14 Runes in the world will be easier to see when you are 40 meters or closer. Hireling 3 When you go offline, a hireling will find Runestones for you. Your hireling refreshes every 24 hours. 12 When you go offline, a hireling will find Runestones for you. Your hireling refreshes every 24 hours. Your hireling has a good chance of finding rarer Runestones. 32 An Enchanter hireling will search for resources for you. A new delivery from your hireling can be claimed the next time you log in or change zones, provided it has been no less than twelve hours since the last bundle. Runestone Extraction 4 Increases the chance of extracting each type of Runestone by 3%. 19 Increases the chance of extracting each type of Runestone by 6%. 29 Increases the chance of extracting each type of Runestone by 10%. The table below shows the amount of skill points required in order to max out the Enchanting skill line. There are 7 achievements related to Enchanting. This page was last modified on 11 April 2019, at 07:08.